I am SO excited! We just recently got a class set of 30 laptops that we share with one other class. We used them for the first time last week to start our first author research project. Right before we began to read "The Miraculous Journey of Edward Tulane," we researched Kate DiCamillo. Boy, did they have a blast! 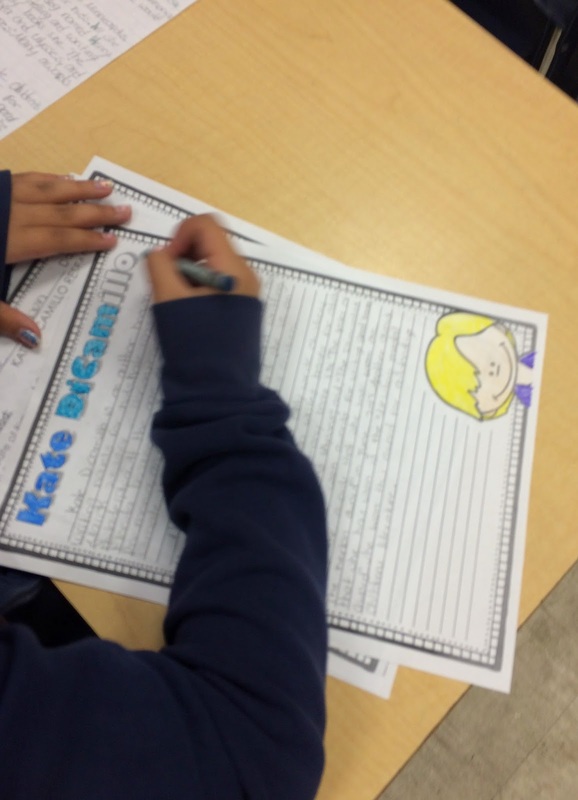 We first read the questions found in my FREE product, Kate DiCamillo Research Paper. Next, we opened up two tabs in our computer, www.worldbookonline.com (an online encyclopedia that the county I work for has purchased access to), and the next was katedicamillo.com. Students then searched for the answers to their questions by searching on both sites. The questions on the worksheet are organized into 3 sections: Childhood, Adulthood, and Author. Organizing these questions into three sections helps students later write their first draft into 3 paragraphs. The students then used their information to write a first draft. We discussed that the research paper needed to start with an introduction as to who Kate DiCamillo was, then they could start talking about her life. Once students were done with their first drafts, we edited them. Finally they wrote their final drafts onto the "Kate DiCamillo" final draft sheet. 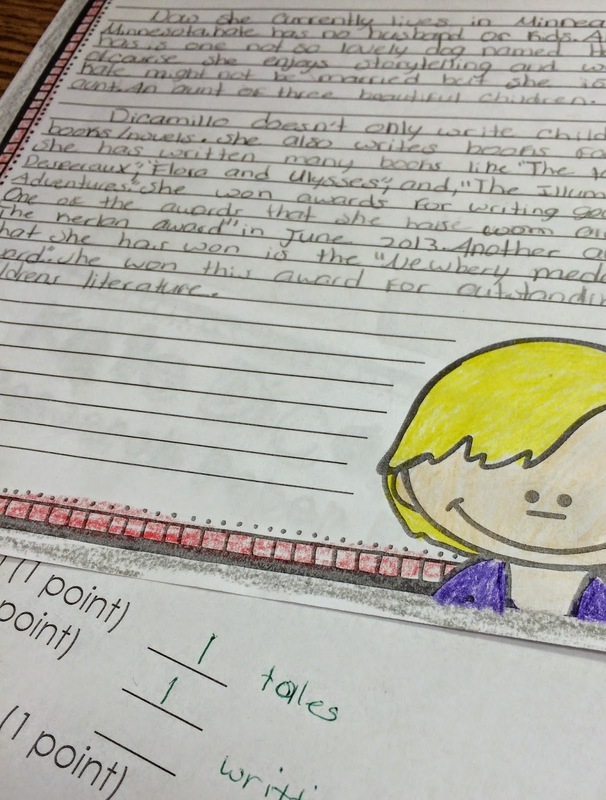 Students colored the pictures in and the writing was then graded and published in our classroom. Students were able to see the entire writing process in a fun and fulfilling way. It was exciting to hear students say, "This is so cool!" or "This is the best day EVER." This is especially exciting during this time of the year when every one is burned out. To top it off, today we did a lesson on primary sources (firsthand accounts) and secondary sources (secondhand accounts). Students were able to refer back to our research and state that the information presented in Kate DiCamillo's website was a primary source, because the "About Kate" section was written in first person. The online encyclopedia was a secondary source because it was written about Kate by others who had done research on her. It was a wonderful connection. Don't you just love it when that happens? Have you done any research projects with your students? If so, I'd love to hear about it. I think our next one will be presented Powerpoint style. I can only imagine the excitement then! Wow 30 computers to share with another class?! Awesome! I love how it tied right into primary and secondary sources. It's the best when that happens. When we did the food chain during ecosystems visit each student had to do an animal description, what it eats, and where it lives. When we got to adaptations we had lots of knowledge about different animals from our research. It was so easy to see how the animal had adapted to its environment or food source. You can imagine my excitement when they told me about the computers. I've been fortunate enough to have at least 5 computers in any classroom I have taught, but this is beyond amazing. I love teaching about animals and adaptations. Children are so natural curious and excited about them, so it makes it very rewarding to teach about them.